One of the oldest myths in the world is the story of the young girl who marries the bear. 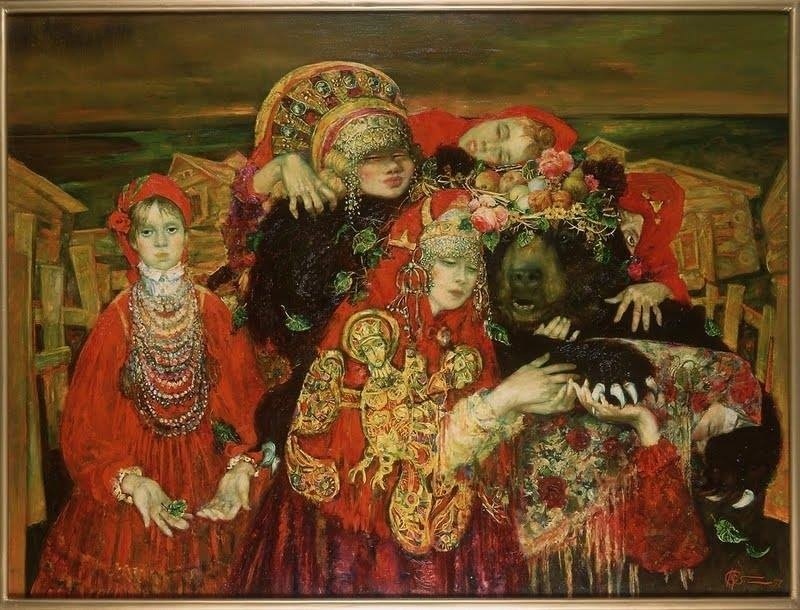 In most versions, the she is captured by the bear because she is indolent or rude and so is taken back to his people where she becomes his wife and bears (sic) him cubs, part bear, part human. It is important to recognize that she is not raped. She marries. Over time she matures. A true bond is created. Sometimes her children are bears and she loves them so. After some time, loneliness for her own people calls her back home and she returns with her sons. When they return to human settlement, they take on and keep the shape of the human. Then, in one version or another, the brothers or her sons, set out to hunt the bear and are taught this mystery by the bear who offers himself to his human kin. The myth is concerned, primarily with right relationship between human and other. The necessity for such a connection is implied in the recognition of Bear people. Bear people and human people are equals in power and the Bear people demonstrate sacred authority. Shape shifting, bear to human, human to bear, is also is central to this myth. What does shape shifting mean politically? We can become each other. This reduces differences. This implies the possibility of alliances and mutual concerns. Such understanding was fundamental to most Indigenous cultures and allowed for ecologically balanced and environmentally sane survival tactics. Hunting is balanced and sacred wisdom is a gift from the animal to the human. However the history of Western culture is one of increasing alienation from the natural world. Disrespect has led us to the degradation of the environment. It has led to the crisis we find ourselves in. The increasing extinction of species leads, if things continue in this way, to our own extinction as well. Right relationship and respect continues as a theme in the fairy tale, The Three Bears. Here there is no recognition of the ‘other’ by the human girl. Goldilocks does not recognize that she is in a foreign terrain and needs to act with respect. She is even more naïve and immature than the girl in the old myth, Goldilocks assumes she has a right to what belongs to the bear. No bond of recognition or connection occurs between human and animal. The Three Bears marks the development of disconnection between the species. This is implied by the bears losing their bearness and living in a human habitat. This is not shape shifting; this is colonization. Beauty and the Beast is another variation on the same theme. Beauty goes to live with the Beast (read Bear.) Then loneliness, for her own people, also calls her home. However, love has been awakened and she returns to the Bea( r)st. This is where the story shifts. The Bea( r)st turns into a man. The shamanic skill of shapeshifting is replaced by enchantment, a conversion by evil means. A profound way of knowing is demonized, a common trend in Western culture. There is a Cherokee Bear legend about the Ani Tsaguhi. http:www.firstpeople us/. A young man from this clan makes his way more and more frequently to the mountains. After a while his parents notice that the young man is growing long brown hair. He is transforming and wants to live away from the people. His parents decide to follow and live where he lives. In this story, the bears will live always. The humans shape shift into bears and the bears teach the sacred songs, reveal the mysteries, so that the hunters will always have good fortune. In a similar Cherokee story, told to me last month, by Cherokee elder Lewis Mehl-Madrona, MD, a young man wants to join the Buffalo people but can’t until he proves that he walks among them with great respect. The old myths teach the good ways (Native American) or right relationship (Buddhist.) They present the political principles through which we are to govern ourselves and our habitats. How far we have come from this: later Western stories reflect our ignorance and disregard. The commentary after the myth on the Indigenous People’s Literature site is “Aho. http://indians.org/indigenous-peoples-literature.html. We are all related.” This is the essential principal from which good governance develops. In early 2013, master storyteller and dear old friend, Diane Wolkstein, asked me to write an essay for a section of StoryTelling Magazine, http://www.storynet.org/magazine.html. which she was guest editing with Loren Neimi on the Politics of Story. When Diane died suddenly while researching her next story project on the Monkey King in Taiwan, Neimi continued with the section. BEAR MEDICINE FOR THE WORLD was published in Volume 25, Issue 2, June-July 2013: Remembering Diane Wolkstein. It broke my heart and eased my heart to be with Diane at the end having known and loved her for over thirty years.